Photo by Fort George G. Meade via Flickr. Passage of one of the strictest vaccine laws in the country was followed by an uptick in vaccine exemptions in a number of California counties, potentially leaving some children at higher risk for preventable diseases. New research out this week casts light on the law’s shortcomings. Health officials say the bill's vague language is partly to blame for wide variation in how schools are enforcing the vaccine rules, according to a study published Thursday in the American Journal of Public Health. California eliminated the ability for parents to send their children to school unvaccinated for nonmedical reasons in 2015. Study authors interviewed city and county health officers, including immunization coordinators and public health nurses, from across the state, to get their perspectives on California Senate Bill 277. “You have this state law that’s broken down to those 61 jurisdictions, but even within those 61 jurisdictions, there’s variation in how certain parts of the law are interpreted and implemented,” said lead author Salini Mohanty, a research fellow at the University of Pennsylvania’s School of Nursing. “Some districts have come down on the side of saying an Individual Education Plan does not allow you an exemption and others have come down on the side of saying an IEP does allow you an exemption,” said one health officer in the study. Without consistent enforcement of vaccine exemption laws, there is potential for geographic clusters of under-immunized and unimmunized children, which lowers herd immunity and increases the chances of local outbreaks, study authors stated. For a contagious disease like measles, about 95 percent of the population needs to be immunized to protect everyone. The bill passed in June 2015 in the wake of a measles outbreak that started in Disneyland and spread to multiple states, infecting 147 people. 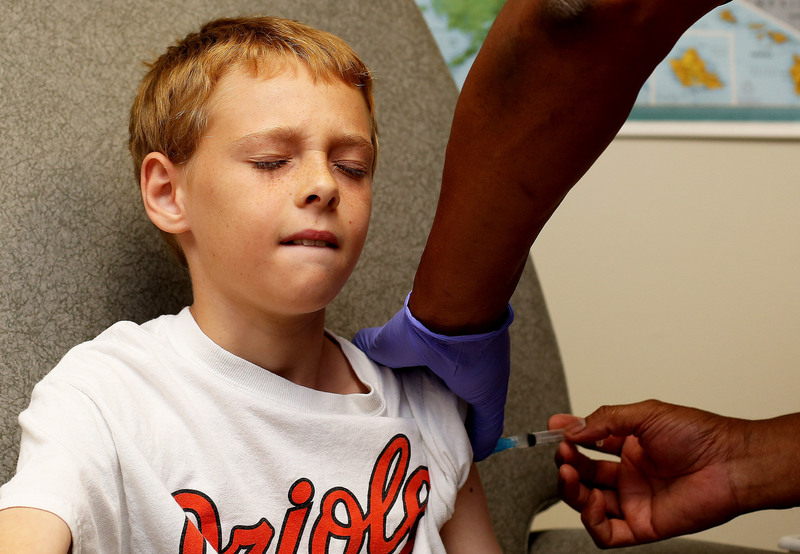 A study showed that vaccine refusal helped fuel that outbreak. In the 2014-15 school year, before the law passed, 90.4 percent of kindergarteners in California schools (public and private) were fully immunized. In the 2017-18 school year (the most recent available data), 95.1 percent of all kindergarteners were fully immunized. By law, kindergarteners are required to be fully immunized against 10 diseases including measles, whooping cough and chickenpox, unless a doctor provides a medical reason that they should be exempt — a child might be undergoing chemotherapy, for example. In another study on SB 277 published earlier this month using the same interviews with health officials, Mohanty and her colleagues reported that the increase in the number of medical exemptions in California caused frustration from officials seeking to curb outbreaks. Prior to the law’s passage, 0.2 percent of kindergarteners statewide had a medical exemption. By 2017-18, that figure had more than tripled to 0.7 percent, according to the California Department of Public Health. A Los Angeles Times analysis found that at 58 schools, 10 percent or more kindergartners had medical exemptions in 2016-17 school year. And at seven schools, 20 percent of kindergarteners had medical exemptions. And a 2017 JAMA study found that counties that had high exemption rates for personal beliefs before SB 277 also had the largest increases in medical exemptions. “(P)ortions of California may remain susceptible to vaccine-preventable disease outbreaks in the near future,” the study stated. Vaccine experts find that uptick telling. In the latest study, officials also bemoaned California’s lack of a system for public health professionals to review medical exemption requests, unlike in West Virginia and Mississippi, where physicians submit a standardized medical exemption request form directly to the state health department for review. In California, parents take their doctor’s note to their child’s school. The notes are not independently reviewed. That helps explain one of the law’s perverse incentives. Health officials in California cited doctors who advertise — and charge for — medical exemptions. “When doctors who want to please their patients, write a medical exemption when there’s no medical exemption, that is an ethical violation of their practice and their profession," Offit said. “I think physicians that do that, frankly, should lose their medical license, because they have violated a principal tenant of their practice, which is ‘Do no harm.’"
The California Department of Public Health has tried to address some of the law’s weaknesses through its rulemaking process. The agency updated the health and safety code to include provisions that medical exemptions must be signed by a California-licensed M.D. or D.O. and that medical exemptions may be issued for no more than 12 months. These rules will be put into effect for the 2019–20 school year. While California seeks to strengthen its vaccine law, other states that allow nonmedical exemptions are facing rising risk of outbreaks. The battle over vaccines will continue, said Dr. Paul Offit.